When you talk about Massachusetts lacrosse Sean Morris is one of the first names that comes to mind. The former Marshfield High School and UMass All-American has cemented his name as a local legend in the sport as he continues to excel on the turf for the Boston Blazers of the NLL. 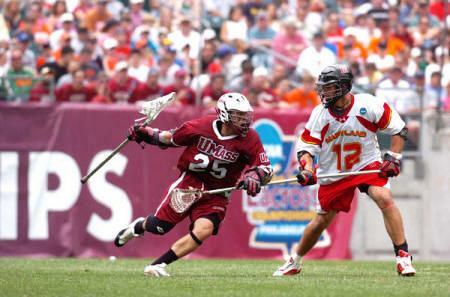 Some of Morris' many accomplishments include being Marshfield High School's (MA) all-time-leading scorer with 324 points (182 g, 142 a), leading UMass to the Final Four and final game in 2006, being the third overall draft pick in the 2006 MLL draft (Chicago), being named a two-time All-American and New England Player of the Year as well as playing for the Boston Cannons of the MLL and the USA World Indoor team. Morris continues to give back to the development of youth lacrosse with his camp, the Sean Morris Lacrosse Academy as well being a director and coach of the summer lacrosse program Laxachusetts. Morris stressed the importance of giving back to the game he loves as we caught up with the Massachusetts lacrosse star in our New England Prep Stars focus on Alumni. Q: Can you talk a little about your upbringing in lacrosse? When did you begin playing and when did your game begin to develop? SM: I grew up playing every sport with football always being my favorite. Dan Collins was one of the directors of the Marshfield youth program and during the summer before 8th grade he put the first stick in my hands. Marshfield had the 8th grade playing in the high school and the lacrosse program had just gone varsity with low numbers. I was fortunate enough to play varsity in 8th grade and I took plenty of bumps and bruises. I was always a great athlete with sub par skills and lacrosse IQ. It was not until my sophomore year rolled around that things started to click for me. Q: What can you attribute your success in lacrosse to and who are some of your role models in and out of the game? SM: I would attribute my success to my family. My father and brother were very instrumental in my overall growth in sports and made sure my work ethic never wavered. The one coach that has always stood out in my mind was Bob Browne, who was my youth football coach. Bob taught me how to compete and how hard to play at a very young age. In lacrosse, head coach Greg Cannella at UMass has been so instrumental with my lacrosse skills, IQ and my overall character. Greg is like a second father figure in my life and he does such a great of developing his players into men. Q: Can you talk about your recruiting experience? What were some of the factors that lead you to UMass? SM: I was recruited more for football than lacrosse actually. I never received one letter or call from Maryland lacrosse, but was being recruited by the Maryland football program beginning my sophomore year. I looked at a few D1, Ivy League and D1 AA schools for football. During my rising senior year summer I played in a camp all-star game at Top Star in Gettysburg College and that is when the lacrosse process began. I decided I would play lacrosse over football during my senior fall and started to take my official visits to UMass, Rutgers, Hobart, Ohio State and Penn State. I chose Rutgers over all of them and in my second week of fall ball the entire coaching staff left to go take the job at Loyola. At that point I ended up sitting out the fall and transferring to UMass for the second semester. Q: What are some of the moments that stand out most to you in your professional and collegiate lacrosse career? SM: My professional experience has been phenomenal. I have traveled the world to play this great game and spread the word about how great the of a game lacrosse truly is. Two moments stand out most in my career. The first being leading a #10 seed through the top 4 seeds in the NCAA tournament to the Championship game where we ran into one of the best teams ever in college lacrosse, UVA. I remember watching Princeton win a national championship at Rutgers when I was in the 10h grade and I made it a personal goal to make the Final Four and do whatever it took to get there. Fortunately, I was surrounded by a great group of players and coaches that wanted it as bad as I did. The second was representing my country at the Indoor World Games where we finished with the bronze medal. Although we fell short of our team goal of Gold, putting the USA jersey on brought tears to my eyes because it had been my goal since 9th grade. The players on the team made the games all the better as we shared so many experiences that will never be forgotten. The host city of Prague, Czech Republic was gorgeous and made for an electric atmosphere. Q: With the advancement of summer lacrosse over the past ten years can you talk about the importance that programs like Laxachusetts play in a player’s exposure and development? SM: Laxachusetts is built off the character of our directors, Dan Chouinard, Mike Connolly, Dave Evans, Brian Vona and myself. All these men have a tremendous amount of lacrosse knowledge and passion for the sport. Each one of these men have had a huge hand in the growth of the sport in Massachusetts and will continue to do so for many years to come. Due to the hectic schedules of college coaches the only time that they can really put into recruiting is in the summer. The Laxachusetts program is putting so many kids into college programs at all divisions as they perform well in the summer time at the top tournaments in the country. Our primary goal in the recruiting process for Laxachusetts is to find the right fit for every player in the program. Dave Evans, a former Brown University assistant coach, has done a fantastic job of advising players and parents about the entire process and helps them through their decision. Q: Being so active in the development of young players can you talk about some of the most important skills that kids should work on to take their game to the next level? SM: Without a doubt the #1 skill that kids of all ages need to master is throwing and catching at their full speed. It sounds simple, but so many players do not know their full speed or have a slight hesitation in their mechanics. My biggest pet peeve is kids who string their stick to shoot fast. A player will make 20 passes before he ever takes a shot in a game, so they have to string their sticks to feed. As for the big jump to college it is all about athleticism now. College coaches all recruit speed with the thought of developing kid's skill sets once they arrive on campus. As this sport continues to explode across the country, the better the athletes are. It makes it even more important to train properly. I credit my success to always training like a football player because those guys are the best athletes in sports. Q: What is the best advice you can give a high school lacrosse player going through the recruiting process and trying to choose a school? SM: Choose a school for the school and the education. I learned the hard way when I selected Rutgers based on how my family and I felt about a coach. College assistants and even head coaches move so often that you should not base your entire decision on the relationship with a particular coach. It is absolutely important that you feel comfortable with the staff, but it is even more important that you focus on the offerings of the school and education that you receive. Lastly, once you select a college it is important to understand the amount of work that needs to go into their game. It is so dramatic that the player can never become complacent. The first day of college practice is an eye opener and you always want to be prepared.